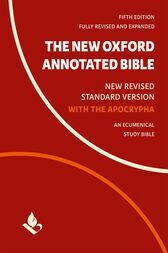 For over 50 years students, professors, clergy, and general readers have relied on The New Oxford Annotated Bible as an unparalleled authority in Study Bibles. This fifth edition of the Annotated, thumb-indexed and in a protective two-piece box, remains the best way to study and understand the Bible at home or in the classroom. This thoroughly revised and substantially updated edition contains the best scholarship informed by recent discoveries and anchored in the solid Study Bible tradition.· Introductions and extensive annotations for each book by acknowledged experts in the field provide context and guidance.· Introductory essays on major groups of biblical writings - Pentateuch, Prophets, Gospels, and other sections - give readers an overview that guides more intensive study.· General essays on history, translation matters, different canons in use today, and issues of daily life in biblical times inform the reader of important aspects of biblical study.· Maps and diagrams within the text contextualize where events took place and how to understand them.· Color maps give readers the geographical orientation they need for understanding historical accounts throughout the Bible.· Timelines, parallel texts, weights and measures, calendars, and other helpful tables help navigate the biblical world.· An extensive glossary of technical terms demystifies the language of biblical scholarship.· An index to the study materials eases the way to the quick location of information.The New Oxford Annotated Bible, with twenty new essays and introductions and others--as well as annotations--fully revised, offers the reader flexibility for any learning style. Beginning with a specific passage or a significant concept, finding information for meditation, sermon preparation, or academic study is straightforward and intuitive.A volume that users will want to keep for continued reference, The New Oxford Annotated Bible continues the Oxford University Press tradition of providing excellence in scholarship for the general reader. Generations of users attest to its status as the best one-volume Bible reference tool for any home, library, or classroom. Michael Coogan is Lecturer on Old Testament/Hebrew Bible at Harvard Divinity School and Director of Publications for the Harvard Semitic Museum. He has also taught at Harvard University, Boston College, Wellesley College, Fordham University, and the University of Waterloo (Ontario), and has participated in and directed archaeological excavations in Israel, Jordan, Cyprus, and Egypt. He is the author of Old Testament text books and The Old Testament: A Very Short Introduction.Marc Z. Brettler is Bernice and Morton Lerner Professor in Judaic Studies at Duke University.Carol Newsom is Charles Howard Candler Professor of Old Testament, Candler School of Theology, Emory University.Pheme Perkins is Professor of Theology at Boston College.